Nearly, three quarter of a million illegal immigrants were arrested trying to cross into the US from Mexico since October! 720,000 were caught… So how many made it here? 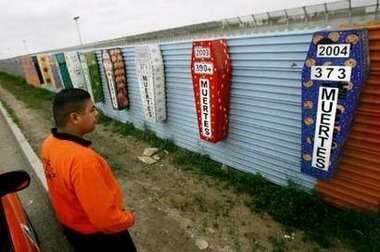 A member of Mexican immigration group Beta looks at an artistic representation showing coffins with the numbers of immigrants who died trying to cross the border between Mexico and the Unites States each year at the wall border limit in Tijuana, Mexico May 6, 2006. Meanwhile, Mexican and Latino moonbats argue that because of the deaths at the border, “America’s border policy” is inhumane (not the ecomomic policies, etc. of the countries the immigrants are coming from) and use it as another reason to bash America. It may be safer for Mexicans to take the trek to America than it is to stay in their homeland and risk being murdered!